I personally don’t believe in the rule of law in the so-called western democracies, it seems that the German police also don’t believe in it. German police authorities again and again ban YPG flags on demonstrations and raid buildings to confiscate such flags, although they lost all court cases that are related with police operations against these flags. The state court of Aachen (Germany) again acquitted a 21 year old activist, after the state prosecuter appealed. The activist was also acquitted in the first verdict. The state court motivated their verdict and made clear that showing YPG flags is not generally forbidden in Germany. I personally don’t believe in the rule of law in the so-called western democracies and I am not the only one: It seems that German police authorities also don’t believe in it. German cops again and again banned YPG flags on demonstrations and raided buildings and apartments to confiscate such flags, although they lost all court cases that are related with police operations against these flags. The state court of Aachen (Germany) again acquitted a 21 year old activist, after the state prosecuter appealed. The activist was also acquitted in the first verdict. The state court motivated their verdict and made clear that showing YPG flags is not generally forbidden in Germany. Last year the state prosecution in Aachen (Germany) started an investigation against 21 year old activist Christian W, after Christian posted an YPG flag on his Facebook profile. The state prosecution charged Christian but lost the first court case on December 11, 2017. But the rule of law isn’t working in Germany. That’s not really a surprise but it’s interesting to see that police authorities are consequently and openly ignoring court verdicts and documents of the German Bundestag. The court verdict didn’t stop cops from increasing repression against the flags and other symbols of the Kurdish movement. After the state prosecution of Aachen lost their first court procedure against Christian, the state prosecution appealed. On February 13 the state court in Aachen confirmed the first court verdict and referred to the answer of the German government after questions about the ban on YPG and YPJ symbols in German parliament (read this document from German parliament – German – PDF file: bungestagypg). 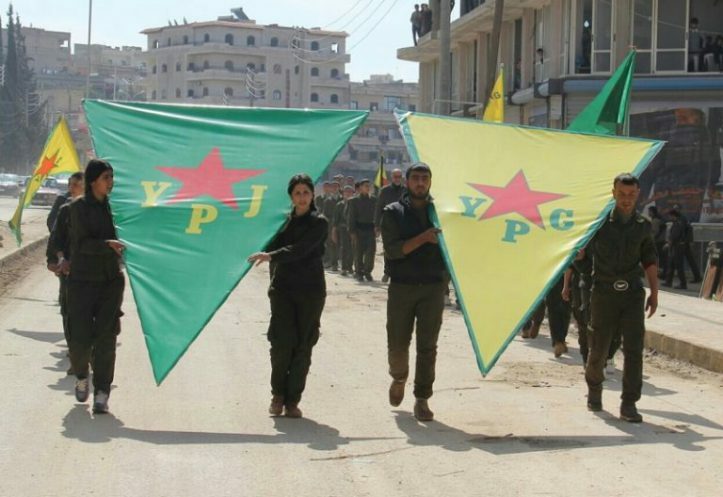 The state court motivated their verdict by saying that: “In the public cognition the image of the “Democratic Union Party” (PYD) and their armed combat units, thus the YPG, are priorly shaped as part of the alliance against the struggle against the IS in northern Syria and not a left-extremist branch of the PKK.” The state court also stated that Christian’s posting of an YPG symbol is not a crime. It’s interesting to see that German police authorities are ignoring the outcome of the debate in German Bundestag and court verdicts. They are actually demasking the so-called rule of law and erode the current system. It seems that they openly switched to an authoritarian police state in which the police is operating as an executive, judiciary and legislative force. Than there is no law that banned YPG and YPJ symbols. It seems that the German state didn’t only sell weapons to Erdogan’s Regime but also adopted some of his authoritarian policies. It’s questionable whether German police authorities will stop their criminalization and repressiom against YPG and YPJ symbols or not. They probably won’t. In fact I wouldn’t be surprised when the cops raid Enough is Enough and/or my private apartment because I deliberately used an image with YPJ and YPG symbols for this article. If they do, we will give an appropriate answer. Our lawyers are ready.